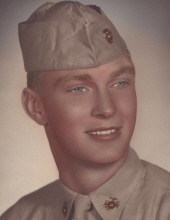 Hastings resident Keith Allyn Asmus, 87, passed away Tuesday, March 19th, 2019, at CHI Health St. Francis in Grand Island, Nebraska. Keith served with the Marine Corps in the Korean War. He lived in Lincoln and when he retired and moved to his beloved farm in Hastings where he took great pride in renovating his family’s old barn. He became very active with the Veterans of foreign wars and especially enjoyed his trip to Washington D.C to visit the Korean Memorial. He loved traveling and spending time with his son Randy attending the sprint car races and fishing. He also loved his dogs very much too. Keith was preceded in death by his parents, Fred and Katie Asmus; wife, Marian Asmus, and brother-in-law, Ted Garratt. Keith is survived by his son, Randy (Paula) Asmus of Lincoln; granddaughter, Nicole Enevoldsen (fiancé Michael Butler); three great-grandchildren. Hailey, Cayden, and Madelyn Enevoldsen all of Lincoln; sister, Lola Garratt; two nephews, David and Michael Garratt all of Tucson AR; mother of son Randy, Marilyn Betz of Lincoln; and special thank you to his partner, Cathy Winegarden, for his loving care to him. Memorials may be directed to the V.F.W. Services will be held 11:00 AM, Wednesday, March 27, 2019, at All Saints Chapel in Good Samaritan Society at Hastings, Nebraska with military honors provided by the Hastings Honor Guard. Following the service, there is a lunch at the D.A.V. in Hastings, NE. DeWitt Funeral Home and Cremation Service is handling arrangements. To send flowers or a remembrance gift to the family of Keith Allyn Asmus, please visit our Tribute Store. "Email Address" would like to share the life celebration of Keith Allyn Asmus. Click on the "link" to go to share a favorite memory or leave a condolence message for the family.